Fancy specialty food stores are not my thing. I fully appreciate how delicious canned cherry tomatoes are, but just because they aren't sold at the Key Foods next door doesn't mean you can charge me $5 for them. So when you walk into Court Street Grocers' small entryway, mind the shelves of pricey mustard and horseradish mayonnaise. They are perfectly legitimate items, they're just not the reason you came here. For now, head toward the back deli counter. That is where the pricey items worth ponying up for reside. 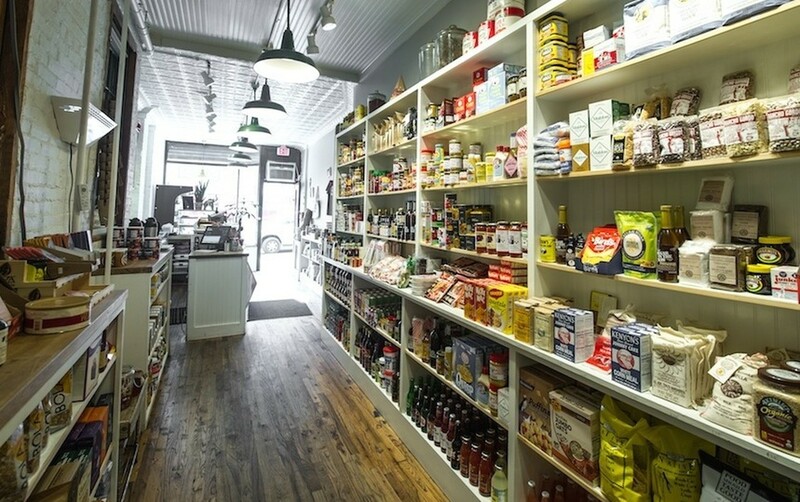 Court Street Grocers, with its main shop situated in Carroll Gardens, is the best sandwich shop you've never been to. Or have been to and are taking waaaay too long to return. At $9-$12, the prices here aren't crazy, even though that money isn't going to land you the massive, size-of-your-torso hero you might expect for $12 worth of turkey. But with a chalkboard this full of hits, who cares. Plus, the guys and gals who work here are crazy nice and seem intent on making sure you love whatever sandwich you are about to inhale, whether you take it to eat on the go or enjoy it at one of the side room tables like a human. To ensure every customer leaves happy, CSG focuses on the two main components of any baller sandwich - the bread, and the meat. Rather than using any old slice, the breads here are sourced from an All Star cast of bakeries around the city, with heavy hitters like Balthazar for French bread and the local Caputo's for its seeded hoagie rolls. For meat, this place house-cures and/or hand-slices just about everything on the menu. So nobody will fault you if you roll through on a weekend and order for the upcoming work week. Unwrap one of these bad boys during lunch on Monday afternoon - your friend's bodega tuna (and probably your friend) will have never looked so sad. The standard two eggs and cheddar cheese on a roll. Except this also has a dose of fresh arugula and comes on really good, chewy ciabatta. The scrambled eggs are cooked up perfectly, and this version ($5.50) is worth the extra couple bucks. Egg? Good. American cheese? Good. Pork? Damn good. Potato Roll? You get the idea. Our first love at this place, the Reuben comes piled with a healthy handful of the house-corned beef brisket. Topped with a couple slices of swiss, some 'kraut, and what the folks behind the counter call “come-back” sauce, this is a treat every time you order it. The best turkey option on the board. Turk, muenster cheese, 'slaw, sour pickles, and the come-back sauce on rye. It's not going to change your life, but it might ruin all other turkey sandwiches for you. Soooo maybe it will change your life. The house made roast beef is another soldier in the CSG army, and the Jawn is one of our favorite ways to order it. Thrown together with a lot of cheese (some swiss, mozz, and pecorino), some veg (lettuce and onion), and sauce (the CSG hoagie spread and mayo) - and yet, the bread (seeded roll) still stands out as special. Another great roast beef-centric option. Same house-made meat, but with French’s fried onions, arugula, and horseradish mayo. Pretty straightforward, pretty delicious. CSG hasn't forgotten about you vegetarians out there. A few different choices, the Uncle Chucky is something you should definitely mess with. Roasted cauliflower, mushrooms, kale, and pickled onions, on a roll. It's hearty and health(ier than the patty melt). Solid order even if you haven't given up meat altogether.